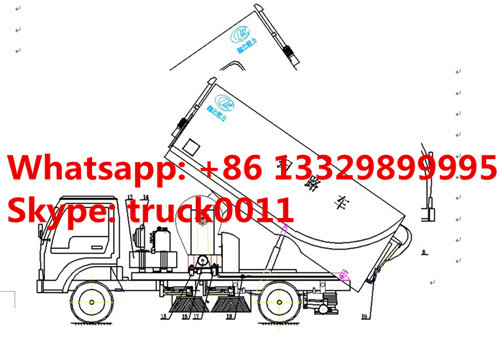 road sweeper truck is installed with middle 4pcs cleaning brushes, and rear part with suction mouth, so the truck cleaning effect is good and the truck water tanker and garbage box made by SS340 stainless steel. Garbage box and the water tank is an integral structure, water tank in the dustbin garbage box bottom plate bottom pretilt angle up to 12°, easy to dump clean. Garbage box is arranged on the top of the guide groove and a larger area of the filtering net, can fully improve the efficiency of dust removal, so that garbage piles evenly, increase effective capacity, reduced due to a blocked filter and the air resistance. 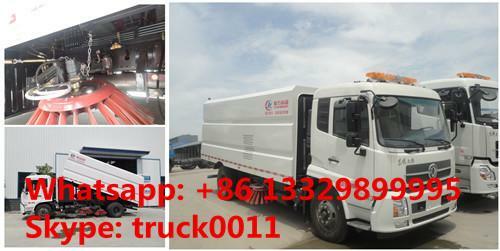 we commit to kinds of sweeper truck with different chassis, any inquiry please contact us.thank you. 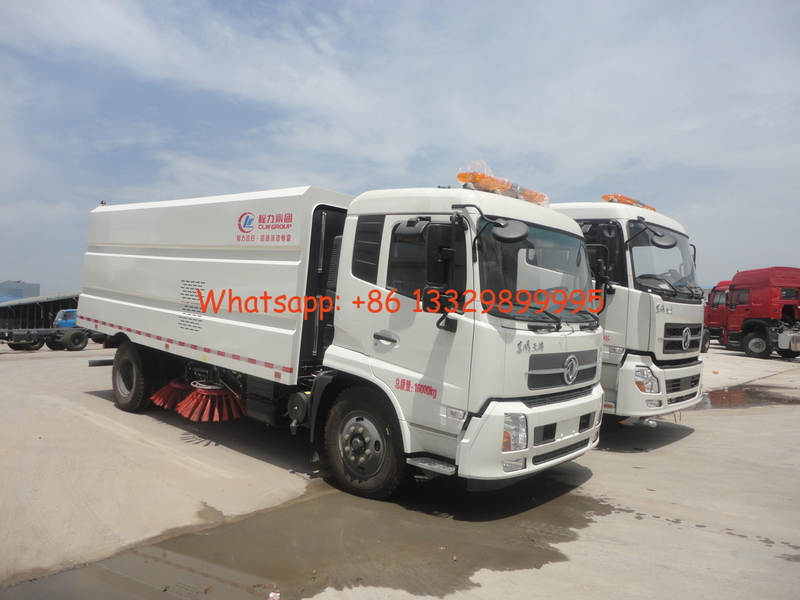 If you're interested in our dongfeng road sweeper truck, please send email to szhj9999@163.com or call +86 13886878855. 1> Equipped with 4 sweeping brush, Cummins 140hp deputy engine; Italian motor; French control switch; Joint venture solenoid valve group; Maintenance-free self-separate clutch; Maintenance-free fan; Stainless steel water tank and dustbin; Rear LED arrow lights, manual pump for emergency system. 3> Optional: monitoring, sprinkler function, self-cleaning function for dustbin. 1,Hghly wear-resistant automatic clutch drives the special fan to control the starting and stopping of the engine. 2,The imported hydraulic components were intergrated folded and conveniently controlled by the electrical and hydraulic system in the cab. 3,stainless steel water tank and material tank are combined and no remained water in the water tank when working . 4,The sweeping device are hydraulic controlled and can avoid inter collision. Automaticlly. 5,the postposition floating type suction nozzle have self-adjustment function to adapt to the bad road condition .And it is easy to debug and maintain..
6,the adjustable mist spray device can eliminate the second pollution as well as saving water. 7,streamline appearance ,low oil consumption,low noise. More pictures of hot sale dongfeng brand street sweeping vehicle manufactured by Chengli Special Automobile Co., Ltd. as below.